Snow Day Poem- Full of figurative language! 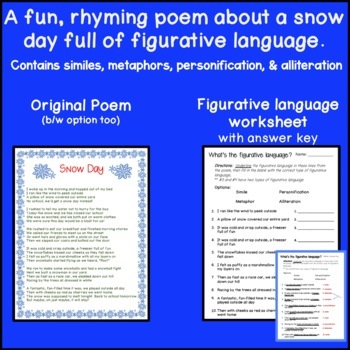 This fun, rhyming, snow day poem is full of figurative language including similes, metaphors, personification, and alliteration. If you purchase this and would like to earn credits to spend on TPT, click here to leave feedback.